This section covers the basics of how surveys are performed with MBES. Beam footprint and parameters influencing their variation are detailed, understanding these concepts paves the way for planning surveys that reduce the uncertainty of surveyed points. IPC procedures for acquisition of MBES are consistent with industry standards and have been shown to produce high quality and consistent survey data. It is recommended that IPC and its MBES contractors continue to uphold these practices, and include TPU (total predicted uncertainty) with their point clouds for potential inclusion in surface error modelling. MBES units are mounted to a vessel and use sound navigation and ranging (SONAR) to measure range distance and angle to the bed of a water-body. When combined with inertial navigation systems, precise positioning and orientation can be measured, which allow the estimation of bed elevations for every return. Ranging measurements are collected by creating sound waves and measuring the time it takes them to return to the MBES. By the time the sound wave reaches the water-body floor it has expanded resulting in the beam reporting an elevation for a region of the water-body floor, not a single point. 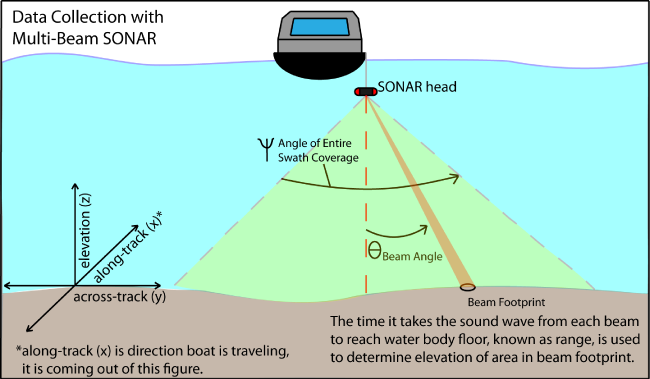 The area providing an elevation measurement for an individual sonar beam is known as the beam-footprint. In MBES, multiple beams are transmitted simultaneously, which create a swath shaped region providing near complete coverage of the water body floor. A basic depiction of this process for one beam is shown in Figure 1. Basic data collection of an MBES. The MBES produces a sound wave which upon striking the river bottom a portion of the sound wave reflects back to the MBES producing a depth measurement. Swath data collection creates non-uniform beam footprints resulting in a non-uniform sampling resolution. 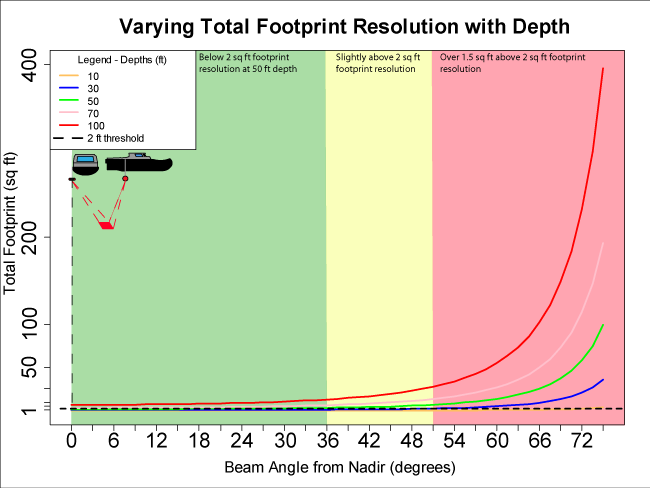 The across-track and along-track sampling resolutions are a function of distance from the boat or depth, angle of incidence, beam width, and slope of surface(International Hydrographic Bureau 2005, Diaz 2000). In general as beam angle or depth increase the size of the footprint increases resulting in a decreased sampling resolution. Slope of the surface being surveyed has a varying effect which is dependent upon the difference between the specific beam angle and the slope of the surface. The effect of beam angle at different depths for the RESON SeaBat 8101 is shown in Figure 2. For the idealized case of a flat bed, figure 2 reveals that a larger range of footprints exists as depth increases. Change in beam footprint by beam at different depths of the total beam footprint. The colored regions designate beam angles producing a footprint less than 2 sq. ft. (green), slightly greater above 2 sq. ft. (yellow), and over 1.5 sq. ft. above 2 sq. ft. The concept of a beam footprint that varies in size is essential to understanding how uncertainty can be introduced into a surveyed point. When a beam footprint is large it has the potential to cover a large range of elevation values within the footprint, but will only return one representative value (see Quantifying Uncertainty for more info on this topic). By understanding the relationships between beam angle, depth, and slope of surface, surveys can be planned which reduce the footprint size and will reduce uncertainty introduced during data acquisition. Given that the solution for beam footprint is a trigonometry function of depth, beam angle, beam width, and slope of surface this equation can be solved using GIS if the user provides a depth raster and slope raster (would need to have previously surveyed the site). These rasters would be used as input to the tool and the equation would be solved to minimize the beam angle (or a range as their generally is not one solution) on a cell by cell basis to create a 'best beam angle' survey map to guide the MBES operator's tracklines and survey strategy. International Hydrographic Bureau.(2005). "Manual on Hydrography:Publication M-13". 1st Edition May 2005. Diaz J.V.M. (2000) "Analysis of mulitbeam sonar data for the characterization of seafloor habitats". Master of Engineering, University of New Brunswick.